1-1/2" Bella Paper Ribbon (1-25yd Roll) for Photography Presentation Boxes These ribbons compliment our boxes perfectly. Widcat's eco-friendly Paper Bella ribbon is made of thin, creased paper. 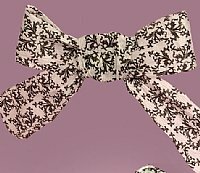 A texture runs the length of the ribbon making it possible to sculpt gorgeous bows. This Bella ribbon is inexpensive, unique, and adds tremendous value to your photo packaging. Inks are water-soluble and therefore color can bleed if wet.